Smithsonian animal ecologist Pete Marra told NPR's Veronique Lacapra that Americans own about 84 million cats, of which 40 to 70 percent are allowed outside. About 50 to 80 percent of those are actually hunters, so around 47 million cats, most of them feral, are killing prey every year. 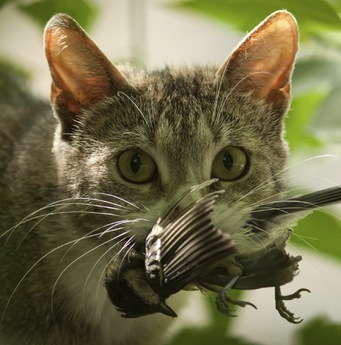 Researchers analyzed all available data to estimate about how many bird and small animals cats kill each year. to be solitary outside of urban areas." 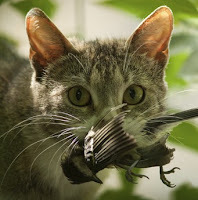 However, the validity of the conclusions of the study rests on multiplying predation data (also very questionable) by the estimates of feral cats. As far as I know, all such estimates are just wild guesses, pulled from thin air and not based on wildlife surveys. Let's get some real data before we start scapegoating cats! Songbirds = Indigenous species vital to the ecosystem. Asian tree beetles have spread all through Mahopac Falls New York decimating Maple trees. What eats Asian tree beetles? Birds. What kills birds? Domestic cats that are descendants of animals brought here from The Fertile Crescent, that are let out by their owners. One invasive species gives rise to another. Domestic cats love the indoors. Let's keep them there. It is where they are the safest. That should be motivation enough for any cat owner that loves their pet.